GASTRONOMY by Joy: Wingman Did More than Just Winging it! I feel so guilty not posting this right away. The draft for this post almost got lost in the track. I somehow blame it on the tons of write ups I have to finish and well, every time I check on this and review the photos, it gets me lost in my mind and just made my eyes fixed on these grubs. You can't blame me I'm a sucker for Buffalo wings, greasy fries, onion rings and those killer sliders. Ahhh, I'm now craving for Wingman's. Before I get all insane, let me give you a bit of a history of how my lust for Wingman's chicken wings began. Years ago, when I still handled our church's Children's Ministry, I brought our teachers there for lunch. Not really mindful of where The Collective is, we got lost looking for it, not realizing that we were taking the opposite path and landed at the wrong end of Malugay St. However elusive the search was, we all managed to keep our patience and finally got to try hefty servings of amazingly flavored chicken wings. 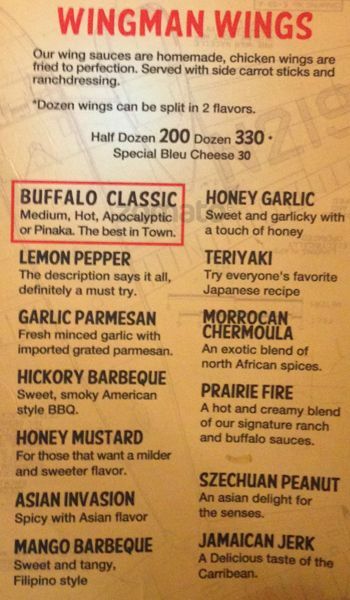 It was my first time to see a menu with variants of Buffalo Wings in spicy, sweet, tangy and Asian flavors. Well, that was years ago, though my longing for it (so does my kids) never ended. Till I finally got reunited, this time with fellow bloggers on a game night. If you think your TGIF's are not getting the excitement anymore. I suggest you head over at Wingman for some action and fun-packed night with your friends and of course to fill your Buffalo wings cravings. The staff can prepare an eventful night of answer and questions, board games and many more. We, on one hand had a Quiz night. Which really tested our Philippine History, Sports, and Wikipedia mastery. Mind you, Erik Waldie, one of the owner, was our Quiz Master, who facilitated the question and answer and have even prepared the questions himself. Boy, let me tell you the questions were and yeah, challenging. But what was really a challenge was how to name all the different flavors of the wings that piled up on our tables. But gobbling them up isn't a challenge at all, just make sure to come with your appetites ready and taste-buds up for an adventure. To make sure you're able to try a number of varieties, come with friends or office mates and share with each variant. You can order full with a dozen buffalo wings, or just six for every flavor. So what's up with their flavors? You can have your wings customized according to hotness. My favorites are Mango Barbeque and Lemon Pepper, though I also like the Moroccan Chermoulla (the sound of it makes me quiver). You can have some pick from the Fries category to go with your Buffie wings, or just drown yourself in ice cold water or beer, hehe. The choices are A basket of hand-cut fries in Shoestring, Regular, Potato Wedge, Curly, Twist; or hand-breaded onion rings. For a price of P120 , that is a steal which is by the way served with their homemade thousand island dip. I kid you not! The servings are huge, made for the voracious eaters. As, I've said ordering is not complicated, you can order half-half of two flavors within a 1 dozen of any flavors of the buffies, with an affordable price of P 330. Must I mention that an order of the wings come with carrot sticks and ranch dressing, or if you feel like splurging , why not order Wingman Bleu Cheese dip with an additional Php20.00, ain't bad at all. Every weekend spent here with your friends, colleague or loved ones would be complete with a glass of Classic Citrus Margarita (Glass is only P100.00 while the Jug is P 500.00). 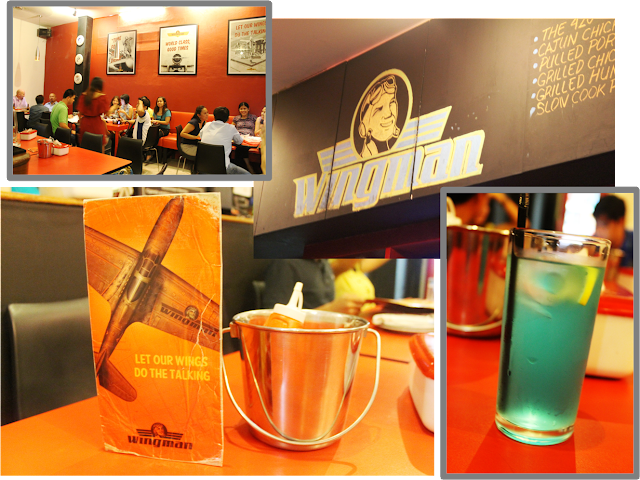 So expect a night with clean fun, top-notched grubs, and refreshment here at Wingman, at The Collective. Address: The Collective, 7274 Malugay St.